Common side effects include diarrhea, vomiting, and allergic reactions. It also increases the risk of yeast infections, headaches, and blood clotting problems. It is not recommended in people with a history of a penicillin allergy. It is relatively safe for use during pregnancy. Amoxicillin/clavulanic acid was approved for medical use in the United States in 1984. It is on the World Health Organization's List of Essential Medicines, the most effective and safe medicines needed in a health system. It is available as a generic medication. The wholesale cost in the developing world is about US$0.18–1.14 per day. In the United States a course of treatment costs $50–100. In 2016 it was the 114th most prescribed medication in the United States with more than 6 million prescriptions. Possible side effects include diarrhea, vomiting, nausea, thrush, and skin rash. These do not usually require medical attention. As with all antimicrobial agents, antibiotic-associated diarrhea due to Clostridium difficile infection—sometimes leading to pseudomembranous colitis—may occur during or after treatment with amoxicillin/clavulanic acid. Rarely, cholestatic jaundice (also referred to as cholestatic hepatitis, a form of liver toxicity) has been associated with amoxicillin/clavulanic acid. The reaction may occur up to several weeks after treatment has stopped, and usually takes weeks to resolve. It is more frequent in men, older people, and those who have taken long courses of treatment; the estimated overall incidence is one in 100,000 exposures. In the United Kingdom, co-amoxiclav carries a warning from the Committee on Safety of Medicines to this effect. As all aminopenicillins, amoxicillin has been associated with Stevens–Johnson syndrome/toxic epidermal necrolysis, although these reactions are very rare. British scientists working at Beecham (now part of GlaxoSmithKline), filed for US patent protection for the drug combination in 1979. They marketed it under the trade name Augmentin. A patent was granted in 1985. Many branded products indicate their strengths as the quantity of amoxicillin. Augmentin 250, for example, contains 250 mg of amoxicillin and 125 mg of clavulanic acid. An intravenous preparation has been available in the UK since 1985, but no parenteral preparation is available in the US; the nearest equivalent is ampicillin/sulbactam. In combination with prednisolone, it is used for intramammary infusion for the treatment of mastitis in lactating cows. Trade names include Clavaseptin, Clavamox, and Synulox. Bacterial antibiotic resistance is a growing problem in veterinary medicine. Amoxicillin/clavulanic acid is reported to be effective against clinical Klebsiella infections, but is not efficacious against Pseudomonas infections. ^ a b c d WHO Model Formulary 2008 (PDF). World Health Organization. 2009. p. 102. ISBN 9789241547659. Archived (PDF) from the original on 13 December 2016. Retrieved 8 December 2016. ^ a b Hamilton, Richart (2015). Tarascon Pocket Pharmacopoeia 2015 Deluxe Lab-Coat Edition. Jones & Bartlett Learning. p. 97. ISBN 9781284057560. ^ a b c d e f g "Amoxicillin and Clavulanate Potassium". The American Society of Health-System Pharmacists. Archived from the original on 29 November 2016. Retrieved 8 December 2016. ^ Gillies, M; Ranakusuma, A; Hoffmann, T; Thorning, S; McGuire, T; Glasziou, P; Del Mar, C (17 November 2014). "Common harms from amoxicillin: a systematic review and meta-analysis of randomized placebo-controlled trials for any indication". Canadian Medical Association Journal. 187: E21–31. doi:10.1503/cmaj.140848. PMC 4284189. PMID 25404399. ^ "Amoxicillin + Clavulanic Acid". International Drug Price Indicator Guide. Retrieved 8 December 2016. ^ a b c d Gordon D (2010). 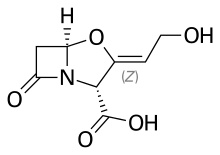 "Amoxicillin–Clavulanic Acid (Co-Amoxiclav)". In Grayson ML; et al. (eds.). Kucers' the Use of Antibiotics: a Clinical Review of Antibacterial, Antifungal, Antiparasitic and Antiviral Drugs. London: Hodder Arnold/ASM Press. pp. 193–4. ISBN 0-340-92767-4. ^ Harr T, French LE (2010). "Toxic epidermal necrolysis and Stevens-Johnson syndrome". Orphanet Journal of Rare Diseases. 5: 39. doi:10.1186/1750-1172-5-39. PMC 3018455. PMID 21162721. ^ "Augmentin -- Prescribing Information" (PDF). December 2006. Archived (PDF) from the original on 20 December 2013. ^ Davies BE, Boon R, Horton R, Reubi FC, Descoeudres CE (October 1988). "Pharmacokinetics of amoxycillin and clavulanic acid in haemodialysis patients following intravenous administration of Augmentin". British Journal of Clinical Pharmacology. 26 (4): 385–90. doi:10.1111/j.1365-2125.1988.tb03395.x. PMC 1386558. PMID 3190988. ^ "Canine Infectious Tracheobronchitis (Kennel Cough)". Archived from the original on 21 May 2006. Retrieved 30 May 2013. ^ "Kennel Cough - Symptoms and Treatment". Archived from the original on 10 May 2013. Retrieved 30 May 2013. ^ Federation of Veterinarians in Europe Position Paper: "Antibiotic Resistance & Prudent Use of Antibiotics in Veterinary Medicine"